Many have wondered why do golf balls have dimples? Golf ball dimples refer to the depressions on the surface of the golf ball, and you will be supprised to find out that the dimples are not there for looks. The dimples on a golf ball actually have a significant effect on golf ball lift and how far a golf ball travels. The early golf ball, known as a featherie, was simply a leather pouch filled with goose feathers. Iniatially it was beleived that a golf smooth surface would travel further with more control. The typical drive with this type of ball was about 150 to 175 yards. Once this ball became wet, it was totally useless. In 1845, the gutta-percha ball (shown above) was introduced. This ball was made from the gum of the Malaysian Sapodilla tree. This resulted in a very smooth surface. The typical drive with the gutta-percha ball was shorter than that obtained with the featherie. However, according to golf legend a professor at Saint Andrews University in Scotland soon discovered that the ball flew farther if the surface was scored or marked. Used golf balls then became preferred by avid golfers. By 1930, the current golf ball with dimples was accepted as the standard design. The modern golf ball consists of rubber thread wound around a rubber core and coated with dimpled enamel. Some dimples come in different shapes such as hexagons. The discovery of the effect of dimples on golf ball distance and trajectory was almost by accident back in the mid 1800's. It was discovered that golf balls with nicks and dents often flew straighter and further than their smooth smooth golf balls. Therefore golf balls started to be created with dimples in the surface. The dimpled golf balls fly further because of the turbulence the dimples create in the boundry layer. 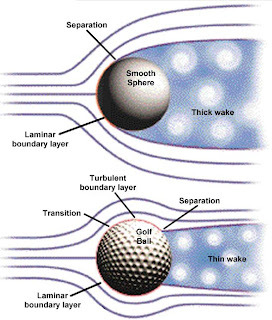 The boundary layer is the thin layer of air surrounding a golf ball as it flies through the air. In the boundary layer, the speed of the air varies from where it contacts the air on the surface of the ball (which is not moving relative to the ball), to where it contacts the mainstream airflow, at the outer edge of the boundary layer. Dimpled golf balls travel further than smooth golf balls is because the dimples on a golf ball create turbulence in the boundary layer. This actually helps reduce drag and increase lift. The dimples actually scoop up air and move it back towards the rear of the ball as the ball spins. By moving more air to the rear, you can -- in effect keep the air pressure behind the ball from dropping. By doing this, the amount of air pressure pulling backwards on the ball is decreased creating less drag. This affect is shown in the picture below.